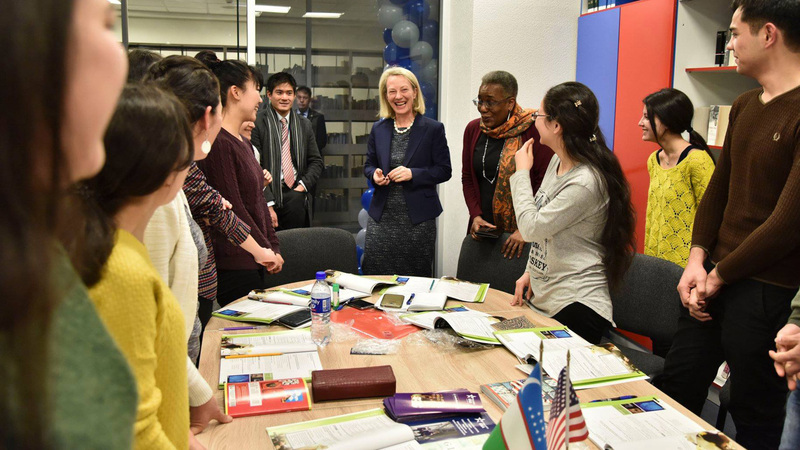 TASHKENT -- The American Councils for International Education (AC) last month resumed operations in Uzbekistan, becoming the first non-governmental organisation (NGO) to be accredited in the country in 15 years. Deputy Justice Minister Akbar Tashkulov presented US Ambassador to Uzbekistan Pamela Spratlen with a certificate of accreditation in a ceremony on August 29 in Tashkent. The Washington-based NGO will organise exchange programmes and internships for university students and teachers, support university partnerships, and send Americans specialising in innovative technologies and intellectual property to Uzbekistan to share their expertise, according to the Justice Ministry. "We are extremely pleased to re-engage with Uzbekistan. We look forward to providing opportunities for American and Uzbek citizens to work together through education," AC Executive Vice President David Patton said in a press release August 30. "There is a great deal of interest and energy on both the US and Uzbek sides to launch a variety of programmes that include institutional collaboration, teacher and faculty development, research, Uzbek and English language study, experiential learning and a host of other areas," he said. "We are excited to play a role in strengthening important ties," Patton said. The organisation seeks to build "a world of globally educated citizens, successful institutions and responsible nations", offering educational and exchange programmes in 85 countries worldwide and awarding 5,000 scholarships per year, according to AC's mission statement. AC operated in Uzbekistan from 1995 until 2006 under the name American Council for Collaboration in Education and Language Study (ACCELS) before Uzbekistan shut down the AC Uzbek operation at a time of tensions between Tashkent and Washington. "Finally! ... This is a long-awaited news and a very good sign!" Nargiza Kuchkarova wrote August 31 on Facebook, commenting on a news story about the return of AC. "ACCELS gave a chance for so many teachers to boost their professional development, enrich their experience and change their lives," she said. "It [has] really widened horizons for hundreds [of] people in Uzbekistan." With the return of AC, former students fondly recalled their experience with the programme. "Thanks to ACCELS, in 2003 I went on an exchange programme to the United States," Aliya Raimbekova, an IT specialist from Tashkent, told Caravanserai. "That trip fundamentally changed my worldview. I realised that I wanted to share my success and become an example for other girls," she said. "I started studying programming languages, and I now work for an international IT company." It is important for Uzbek students to have experience studying abroad, Raimbekova said. "It enables you to go above and beyond and think differently, [a skill] our youth lack," she said. "After 2005, Uzbekistan shut down all American and European NGOs," Tashkent-based political scientist Umid Asatullayev told Caravanserai. "ACCELS was no exception ... [even though] the organisation enjoyed immense popularity with youth and college students." "Restarting ACCELS [in Uzbekistan] is a historic event -- it is the first American NGO to receive registration in Uzbekistan after [all the NGOs] were expelled," he said. US-Uzbek relations improved after Uzbek President Shavkat Mirziyoyev gained power in December 2016. Mirziyoyev himself personally expressed an interest in bringing AC back to Uzbekistan during a speech at the US-Uzbekistan Business Forum in New York September 20, 2017, according to Patton. Later on May 16, Mirziyoyev and US President Donald Trump welcomed AC's then-pending reinstatement during a meeting in the White House. The return of AC "demonstrates our growing strategic partnership ... and the government of Uzbekistan's commitment to meaningful reform and international engagement," US State Department spokesperson Heather Nauert said during a briefing August 29 in Washington.